As the audience enters they are greeted by the hosts and offered sweeties. 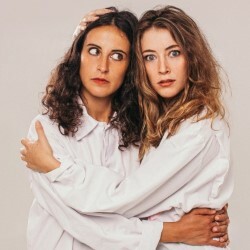 Roisin O’Mahony and Chiara Goldsmith then perform a show which I can only describe as crazy, silly and ridiculously funny. The bribery is unnecessary, because this is an awesome show. There is an underlying intelligence to the sketch show, which added to the enjoyment. What I did miss were many of the musical call and response shout-outs from modern mainstream culture, but then I’m a grumpy old curmudgeon, and everyone else enjoyed them (knowing something about Bo Selecta would have been handy). They did do a version of Roxanne, and I know that one. Roisin acted slightly more crazy than Chiara (a fine line) and wore some cool masks in a couple of sketches. They did interact with a couple of audience members as part of their act, so be careful where you sit. There is a bit of swearing, but nothing too extreme and it should be fine for teenagers and older. It can get a bit wild, but if you’re up for an inspired hour of silly sketches from a pair of energetic and frantic comedians, while witnessing some really gross marshmallow eating, then add this to your list. Note: It’s free but this is filling up fast, so pre-book to ensure a seat.